Synopsis: Nina Parker, a divorced mother of two is fighting the most challenging problem of her life, not raising a teenage daughter or the love she still has for her ex husband, Hunt, but the demon that is alcoholism. Deciding to move back to her home town of Abbey Hills that she abandoned as a teen, Nina along with her teenage daughter, Meagan, try to become reacquainted with life in a small town. With their arrival, the small Ozark town must deal with strange and ritualistic murders that are taking place and officials must find who or what is responsible before another life is taken. Along with these terrifying murders and events from Nina's past, and the mysterious new neighbor, Markus her tenuous hold on sobriety is severely tested. My Review: Having read Tracey Bateman's sweet prairie romances I wasn't really sure what to expect with her latest release, Thirsty. It's a suspense and one of the main characters IS a vampire...completely the opposite of what I'm used to reading from Tracey! Being a lover of Christian fiction and paranormal/vampire fiction I was really excited to read this and I wasn't disappointed. For all those leery of the vampire, bloodsucking, type books this novel is NOT really one of those. There are some crime scene descriptions and a hostage type situation but nothing that I haven't read in other Christian suspense. That being said even if you're not a fan of Christian books, this is not at all preachy but rather a clean story of the life of a woman facing her past and all of the problems that came from life growing up as an alcoholic from a very young age. I'll admit I'm not a reader of a lot of suspense books and I'm not sure if this was really a suspense. It wasn't an edge of the seat type read. Nina's story was really touching and I was thoroughly entertained while reading Thirsty! I really liked, Hunt and Markus too and the ending was terrific. Nina's story is really sad, her struggle very realistic. 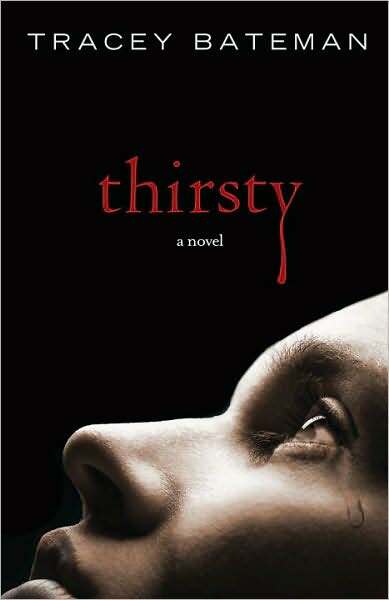 Tracey did an excellent job with this, I would recommend Thirsty to all readers, guys included and am very much looking forward to Tracey's next book! I have read some of Tracey Bateman's books, but I think I'll pass on this one. Here is my teaser for this week.